I read the petition seeking ESA listing of pikas. It did not really address the issue of the very serious livestock grazing conflicts with pikas across many areas of their range. This is especially true with domestic sheep that are herded into high elevation areas – and that can wipe out the “harvestable” hay for a pika in a one-time pass-through grazing event. This is exactly what I have observed happening the Sawtooths, where domestic sheep are run right across the grasses and forbs at the base of higher elevation pika-inhabited talus slopes up Beaver, Frenchman and Alturas Creek. 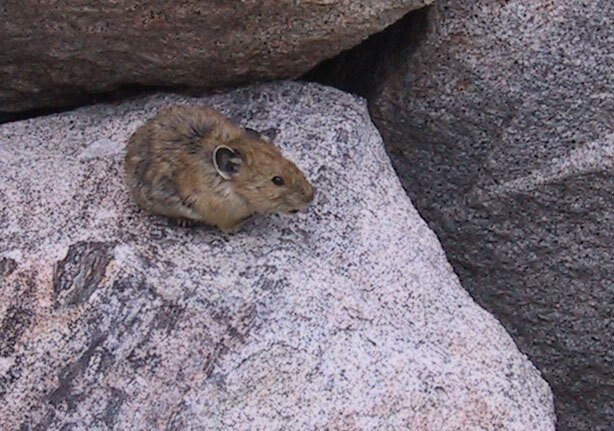 Pikas are tied to a very specific area – the talus and the little bit of grass and forb “production” right by it. Since they chew off and dry grass, and then cache it in rocks for the winter, imagine the effect of a herd of range maggots moving through in mid-summer. This also does not take into account the longer-term losses of pika food from livestock depleting perennial vegetation, causing soil erosion altering the types of veg that can be supported, etc. Plus, grazing causes local site “climate change” – by desertifying sites – fewer, sparser food plants, less ground shade = hotter, drier site.